David son of Jesse was king over all Israel. He ruled over Israel forty years—seven in Hebron and thirty-three in Jerusalem. He died at a good old age, having enjoyed long life, wealth and honor. His son Solomon succeeded him as king. Wendy and I have begun to declutter our house. It’s interesting the accumulation of “stuff” after nearly a decade. I find myself increasingly willing to get rid of things that, for some apparent reason, I felt I really needed at one time. I find it interesting what your heart labels as “treasure” and what you consider “junk.” Yesterday I came across a tub which contains my grandmother’s diaries, which I still treasure and hope to catalog more thoroughly some day. Thursday, June 19, 1969 – Got up late. Slept good. We did a big wash + ironing. Went for a ride this eve. Sure enjoyed it. Dad drove car. Hot day. 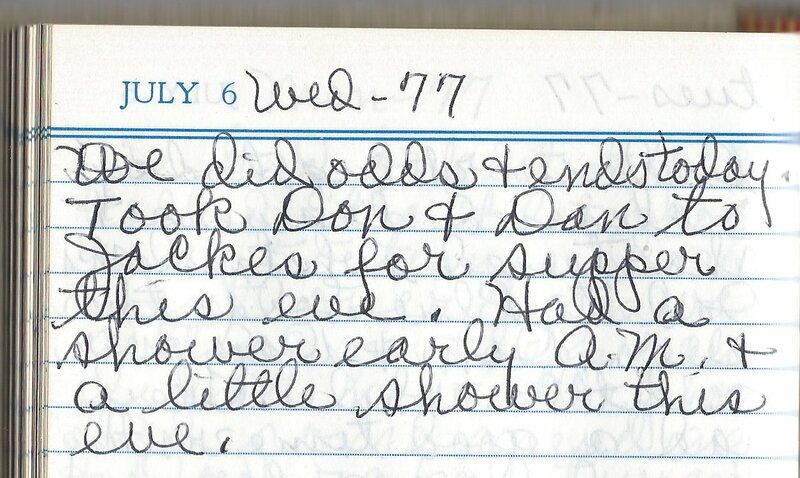 Wednesday, July 6, 1977 – We did odds + ends today. Took Don and Dan to Jackes for supper this eve. Had a shower early a.m. + a little shower this eve. It was the last diary entry my grandmother would make. After writing this entry, she and my grandpa went for a walk “up town” and were struck by a car while crossing the street. My grandmother died that night. My grandfather picked up the daily duty of writing in the diary and continued the practice until late in his life. How easily we forget life’s fragility. In our hearts we all plan to live to a ripe old age and hand off our accumulated “stuff” to our children just as King David did in today’s chapter. And yet, there is always the possibility that we are just an evening stroll and a distracted driver away from making our own final entry in this life’s daily diary. I found it interesting that in his advanced age, and in the moment of his giving away the throne, King David recognized that everything came from and belonged to God. It’s easier to give away what was never yours in the first place, and the further I get in this life journey the more I recognize David’s realization in my own heart. Today, I’m grateful for what I’ve been given. I’m seeking to let go of the notion that I can lay claim to anything and think that it is mine; not even this beautiful summer day in July. Tom here it is almost exactly 2 years since you made this post and my friend Todd an I are coming across the same passage today in our own chapter a day walk that was inspired by yours nearly 5 years ago. I chose the same verse today as I wrote my short note. I want to remember God has given me everything and not to rest on tithing as giving all I need but to be listening for any direction God gives me to use what is his for the purpose he desires–not mine. whenever Todd and I get stuck without out a really take on the days chapter I turn to your chapter a day index for some inspiration. Have a great day! Congrats to you and Todd for your own chapter-a-day journey, Chris. Thanks for sharing this. What a great encouragement to start my day! Your reflection touched my heart this morning. Thank you Tom. Thanks for letting me know Marinus! I’m grateful for you. 17 I know, my God, that you test the heart and are pleased with integrity. All these things I have given willingly and with honest intent. This little verse is tucked away in this chapter, but it jumped out at me today. It speaks of God testing the heart, being pleased with integrity and addresses the act of giving. These are areas that I know God cares deeply about and I pray that I continue to grow in my ability to serve God with my giving and intent.